We've seen lots of lovely birds over the last few days, starting with over 100 waxwings flying around Fountainbridge near where we live. Waxwings are native to Scandanavia but often in the winter flocks of them will visit the northern parts of the UK for our milder climate and supplies of berries for them to eat. Waxwings also seem constantly to be on the move, and these we saw on Christmas Day were no different, so we couldn't catch them on camera but it was lovely to see them swirling across the sky, sometimes landing in the rowan trees and sometimes on the roofs. and this treecreeper - which is very well camoflaged - can you see it? 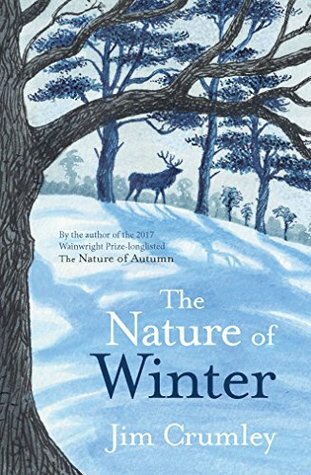 This book is a meditation on the nature of winter, taking in detailed observations of the natural world during the coldest time of the year in Scotland, thoughts about how winter is changing as climate change starts to impact our world, thoughts on other human impacts on nature, meditations on rewildling and it's positive impact on the landscape and mediations on 'being a nature writer'. I thought there was rather too much of the last and sometimes the language became too flowery and overwritten for my personal tastes. This section about the dipper continued for a few paragraphs and leaped out at me as just the day that I read it I had been talking to someone alongside the Water of Leith about how amazing it is to hear the dipper singing in winter. This is a good book for anyone interested in the nature of Scotland or in how winter is changing and ultimately offers a profound argument for the need to immediately address climate change and our whole relationship with nature. The Nature of Winter by Jim Crumley published by Birlinn. Printed and bound in the EU on sustainably sourced paper. As ever it's decorated with an eclectic mix of odd earrings, old necklaces, a couple of paper decorations from a Cat Protection charity and a couple of actual Christmas decorations which I've had for years. Once Christmas is over the tree will return to the garden and we may well welcome the same tree back into the flat again next Christmas! We try to be as envionmentally friendly at Christmas as possible. I've read in several places recently that many types of Christmas wrapping paper can't be recycled but most articles don't seem to mention that this doesn't stop you re-using the paper in imaginative ways, even small pieces can be reused. 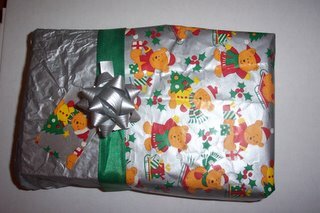 Here are some examples of how I've reused wrapping paper in previous years. I'm trying to use less sticky tape (which is plastic and comes with all the problems we increasingly associate with plastic) but I am prone to wrapping disasters if I use raffia or ribbons without any sticky tape at all! I try to buy locally made gifts, second hand gifts, vouchers for gifts to charity (like a donation for protecting an acre of rainforest) or make my own gifts. 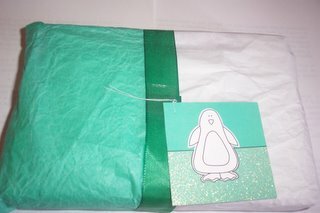 Edited to add: I just found this interesting article about minimalist gift giving. Do you have any tips for a greener Christmas? Feel free to share your ideas in the comments section! And now (ie in 2018) I have three poems up on Route 7, you can find them here, here and here. Is Princes Street Gardens a Public Green Space or a Venue for Private Parties? I remember the days when on Christmas Day you could walk through Edinburgh's Princes Street Gardens and enjoy the peace and quiet of this lovely city centre green space. These not only restrict our passage round the city centre's major public green space but they ruin the asthetic appeal of the gardens. Why is this happening? Well this week it's because they're preparing for Edinburgh's Hogmanay concert, which costs a mere £65 for a ticket if you want to watch from inside the gardens (and access to surrounding streets has for years been ticketed too during the time of the concert). The gardens will be entirely shut to public access from at least Christmas Day to the beginning of January. These days Edinburgh's festivals all seem to be organised by the all powerful Underbelly. And Princes Street Gardens are cordoned off or shut entirely for large periods of time during every festival. So that means for significant portions of the year we don't have access to the only large public green space in the city centre. There's a lot of anger around in Edinburgh these days about overtourism with our tourism chief accusing the city of hating tourists and suggesting that Disneyfication of Edinburgh wouldn't be a bad thing, thus overlooking the fact that Disneyland is a tourist venue and Edinburgh is a city where people live. We don't hate tourists anyway, we just want the tourist attractions not to swamp the streets and parks so that we all, tourists and residents alike can move freely around Princes Street Gardens, in the same way that this squirrel can. It's not the time of year for butterflies, you're unlikely in the UK to see any butterflies in December unless it's a hibernating small tortoiseshell in your garden shed. However I found today an article about how the speckled wood butterfly is increasing and expanding its range in Scotland. I've certainly seen plenty of them in the past few years - such as this one in the small woodland area at the Musselburgh Lagoons, seen in October this year. At the end of the article was a link to the Butterfly Conservation website where I found out about the Urban Butterfly project. The Urban Butterfly Project offers a way to help Butterfly Conservation discover which species of butterfly are most at home in the towns and cities of central Scotland.The results will allow the organisation to see how butterfly populations are faring and will influence their conservation work in Scotland. Most species of butterfly are relatively easy to identify and will often stay still in warm weather making observation and photography even easier. You can download a PDF of the activity pack here. To take part in the project it's advised (though not necessary as they will accept paper records) that you join iRecord, which is a website (and also mobile app) where you can share your wildlife sightings to make it easier for sightings to be collated, checked by experts and made available to support research and decision-making at local and national levels. So if you live in the urban areas of Edinburgh, joining the Urban Butterfly Project might be a good new year's resolution! Meanwhile, the lovely shadows of the beech tree below (also in Craiglockart Dell) are from earlier this year, at the beginning of autumn. The rock in this photo is interesting too as it's a glacial erratic, a rock that was left here after the glaciers retreated at the end of the last ice age. We watched a moorhen climb all the way up this weir though we couldn't capture this on film! We didn't see any waxwings in the park and many of the berries trees in the park were empty of berries indicating that the waxwings have probably already been and gone and eaten everything they can. Inspired by a Russian fairy tale as told by Arthur Rackham this is the story of a couple who have moved to Alaska in the 1920s after losing a child. 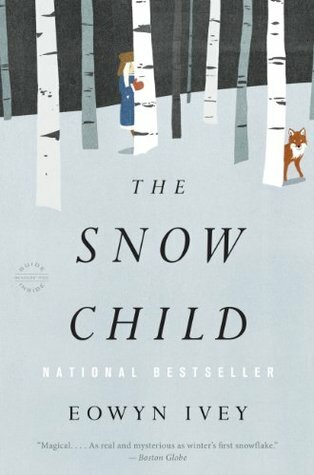 One winter's day they make a snow child on their land and soon after that an unknown girl starts appearing in the nearby woods, often accompanied by a red fox. This is a beautifully written story of pioneering life, closely describing the difficulties of farming new land in a cold climate, hunting and trapping animals for food, the relationship that the couple form with their nearest neighbours and the unfolding story of the mysterious girl, Faina. Is Raina real or a fantasy that the couple have created from the cold winter? Ivey really creates a magical winter atmosphere, with snowstorms and lots of winter wildlife. This is a lovely winter read. I attended an excellent training course with Buglife Scotland today - an Introduction to Freshwater Invertebrates. The day started with an excellent (though by necessity very speedy) introduction to the freshwater invertebrates found in Scotland by Craig MacAdam. There are many different types, including the larval forms of many species of insects that we don't think of as associated with water (it was good to be reminded that 1/3 - 1/2 of all hoverfly species start life as aquatic larvae!). We split into pairs, each pair with their own set of equipment. filled the white basin with a little water, used a net to catch invertebrates from the water then emptied the contents of the net into the basin and then caught them in the spoon and sorted them into the snack dish. Once we had studied what we had found we then released them back into the water at approximately the same point they had been removed from. We also found a number of caddis fly larvae in their carefully constructed cases, though none of my photos of caddis fly larvae turned out. Each species of cased caddis fly creates a different style of case using a different selection of natural and sometimes articifial materials (including for example: plant stems, shells, grains of sand and bits of plastic). Some of these cases are really beautiful (I tried to search for a good website with photos of a variety of caddis fly larval cases and couldn't find one, if I later find one I'll add the link here or feel free to let me know of such a site in the comments). It was an excellent training day - I can thoroughly recommend Buglife courses if you're interested in invertebrates. alive in the ghostly fields. I also today reposted an old poem on my Shapeshifting Green blog, which you can read here. Sinan (Aydin Doğu Demirkol) is a recent graduate set to become a primary school teacher, but he's really more interested in finding a publisher for his first novel. He returns to his hometown of Çan, hoping to scrape enough money together, but instead is faced with family debts caused by his father's gambling addiction. Director Nuri Bilge Ceylan tells the story slowly, relying on lots of dialogue (some conversations do seem to go on rather long, interesting though they are). The cinematography and acting are equally beautiful and the complex relationships between the characters are drawn out with insight and sensitivity and a nice touch of quiet humour. The film deals sensitively and subtly with issues including rural depopulation and how to live life as a good Muslim. Any aspiring writers watching this film may well find Sinan's journey to becoming a writer as disheartening as it is believable, so it may be one to avoid if you're feeling low about your writing prospects! This is a beautiful, slow (3 hours) meditation on life and well worth seeing if you like slow films. The Wild Pear Tree is screening at Edinburgh Filmhouse until Sunday 16 December. We also kept our eyes open for the otter that has been recently seen here, though no luck today! But the Figgate Park is always a lovely place for a walk whether or not you see the otters or the raer ducks that sometimes appear there (including mandarin, shoveller and gadwall!). Subtitled The Private Life of an English Field, this is a beautiful, meditative book about the changing seasons in a meadow on the English Welsh border. As well as describing working the land through the year, Lewis-Stempel documents the birds and other animals that share his land, the declining curlews, the playful otter, the badgers and foxes. Like the best nature writers he focuses on nature, not on himself and his descriptions are detailed and often lyrical but never overblown or self consciously poetic. I enjoyed this book from the beginning, but loved it from the July chapter onwards, when the reader really feels present in this wonderful place of balance between farmland and natural landscape. This book won the Wainwright Prize for Nature Writing in 2015. Meadowland by John Lewis-Stempel published by Transworld Books (2014) on Forest Stewardship Council certified paper. We had a lovely weekend visiting my Dad and walked round Blackleach Country Park where there were lots of birds on the lake, including over 20 gadwall and over 20 shovellers. We also spent time in the lovely Hug in a Mug cafe in Walkden town centre - a real community cafe which hosts craft groups and sells items made by those groups and also locally made honey. We bought some candles made by local crafter I Love Gracie and a jar of honey. Buy me a virtual coffee! Words and photos copyright Juliet Wilson, except for book cover photos or unless otherwise stated. Please don’t use my work without asking, it’s impolite; bad karma & infringes copyright. Read more about copyright for bloggers. Please also note, I DO NOT ACCEPT GUEST BLOG POSTS FROM PEOPLE WHO RANDOMLY EMAIL ME. Delighted to be included here!